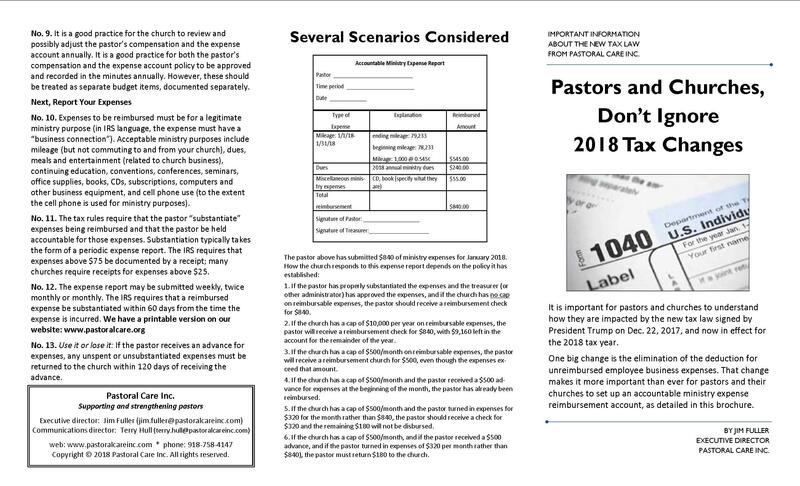 The 2018 Tax Laws may affect most of our pastors. The Standard Deduction for 2018 will double to $24,000 (married filing jointly), which will affect most pastors on them deducting certain items (mileage, dues, ministry expenses, etc) from their Schedule A. Beginning on January 1, 2018, Unreimbursed Business Expenses are gone! This Standard Deduction was raised in hopes to make our tax system simpler, more convenient, and to eliminate the hassle of filing a long form. Very Important---Pastors can set up a ministry expense through their church in which they can have these expenses reimbursed back tax-free, just as they do for housing. If done properly, expenses are not subject to Self Employment. 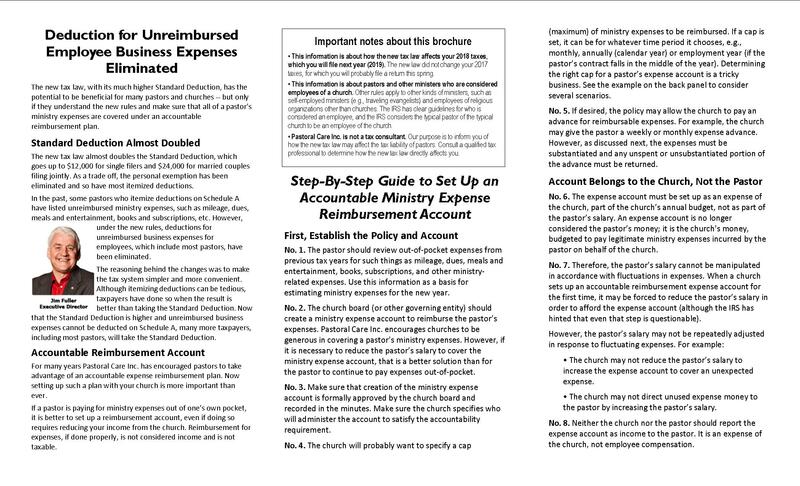 Pastoral Care, Inc. strongly encourages church boards to respond to the new tax law by resturcturing their package to include setting up an expense account from which your pastor's ministry expenes may be reimbursed in order to reduce his/her taxable income. It is possible to do this in a way that does not increase the church's total budget. For pastors who must pay their ministry expenses out-of-pocket, it could be better for them to receive a lower salary along with an expense reimbursement account. Your package will still remain the same dollar amount but pastors can benefit from claiming a double standard deduction and having their expensesd paid tax-free. Estimate your expenses from previous tax years (2017 and prior) on your mileage, due, ministry materials and other expenses. If the church cannot afford to increase your package to include a reimbursement account, then ask to create a ministry expense account equal to your estimate. Deduct this amount from your base salary. Create a Ministry Expense Account from your church so that you can submit reimbursement from these funds. It is best to under estimate as you cannot go beyond the set amount you have chosen. Have this Ministry Expense Account discussed and voted on with your board and is in your board minutes. *This limit is only an illustration. If you use a $500 limit for your Ministry Expense Account, based on the previous Figure 1 Illustration figures, you would lose $340.00 that cannot be reimbursed by the church (since there is not enough money to reimburse). This is why you must be as accurate as possible. **You need to take a look at your usual business expenses that you incur. Since these expenses are no longer available on Schedule A. You may also visit with your tax person to get an idea on your 2018 expense limit or review your expenses from past returns. Expenses and mileage from each pastor will vary. Again, the illustrations are for you to understand how this works. NOTE: If you do not choose to have your business expenses to be reimbursed as we have mentioned above, you choose to use your Standard Deduction of $24,000 for 2018. Restructuring your salary/expenses can be a tremendous benefit for you because you can claim your Standard Deduction of $24,000 plus have your expenses channeled through the church as a benefit to reimburse you for your expenses. Again, please deduct the same yearly limit you wish to choose from your salary. Your salary will decrease but you will probably net more by doing it this way. Again, this does not affect your 2017 tax return, just expenses from this year forward. Disclaimer: Please check with your tax consultant. Pastoral Care, Inc. is not a tax consultant. It is merely sharing information given by us from another tax consultant to advise you of these possibilities. Pastoral Care, Inc. does not intend to represent itself as a tax authority and strongly suggest you contact your tax person.